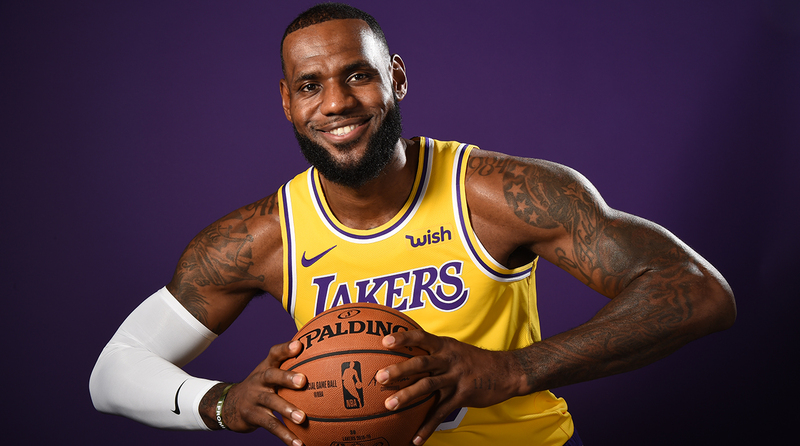 LeBron opted to stray away from talk of a potential rivalry with the Warriors and focus more on the potential growth of this L.A. team at Lakers Media Day. LOS ANGELES — Every parking spot in the practice facility’s lot was filled, with television trucks spilling into the surrounding streets in all directions. Every seat at the makeshift press conference was occupied, leading more than 100 media members to form a standing-room-only semi-circular blob around the podium. His every movement—from the first glimpse of his new yellow jersey to multiple photo shoots and on to a half-dozen chats—was documented by a roving band of tweeters and Instagrammers. His every word during a 12-minute group interview was aired live on national television. Meanwhile, cognitive dissonance loomed all around him. Lonzo Ball, last year’s Media Day darling, was cast aside in favor of the bigger story. Rajon Rondo, former Celtic, prompted bug-eyed disbelief by donning a Lakers jersey. Lance Stephenson, proudly wearing custom sneakers emblazoned with his jersey number, broke into laughter when asked whether he had discussed the infamous ear-blowing incident with his new teammate and former rival. (He hadn’t.) Coach Luke Walton, yet to win more than 35 games in a season during his two-year tenure in L.A., smiled at the thought of coaching “the best player in the game right now” and broke out the first of many Kobe Bryant comparisons. But after nearly three months of frantic anticipation from outsiders, James and the Lakers still aren’t totally sure what to make of each other. “I don’t expect nothing,” James said blankly, when asked for his outlook on the upcoming season. “It’s the unknown.” Walton wasn’t ready to commit to a starting five, and he added that he’s “not desperate” to fix a set rotation. Key questions—like how fast the Lakers plan to play, how often they want to deploy small-ball lineups and how James’s minutes will be managed—were discussed in vague and noncommittal terms. This laboratory experiment will not be rushed, even if the constant pressure on James to add to his ring count traveled with him to L.A. Despite the intense attention that greeted him, one could argue that James’s offseason move has lessened, or at least refashioned, the pressure that he faces. In Cleveland, he was the hunted, defending his streak of eight straight Finals appearances from the rising Celtics, Sixers and Raptors. In L.A., without an All-Star sidekick let alone a Superteam, he’s now the hunter, free to take aim at the Warriors and Rockets as a genuine underdog. While the NBA predictably scheduled Warriors/Lakers as the marquee game on its Christmas Day and MLK Jr. Day showcases, James bypassed any rivalry talk and went out of his way to play up the quality of the competition. That circumspect tone marked a clear shift from his Cleveland days, when Golden State’s stars were fodder for Halloween tombstones and the Cavaliers spent last season, even after the Kyrie Irving trade, pursuing a title by any means necessary. On his first day in L.A., somewhere in between the wall of cameras and the waves of microphones, James found what he had been looking for: a reset button.